Westmeath is an inland county that contains some delightful scenery – chiefly near the center of the county, where a number of lakes with wooded shores and surrounding hills provide many charming views. There are other lakes on the northern border and in the west is Lough Ree, a large expansion of the River Shannon, where the boundaries of Counties Westmeath, Longford and Roscommon meet. Much of County Westmeath is flat, and its highest point rises to a little more than 850 feet. Home to great abbeys and Castles including Tullynally Castle, a 17th century Castle with numerous turrets and battlements. 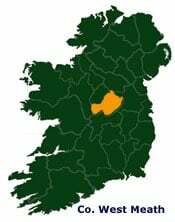 Westmeath has an area of 1,763 sq km (681 sq mi). The principal rivers are the Shannon and the Brosna, and numerous lakes, or loughs, are in the county, the largest of which is Lough Ree. Agriculture is the chief occupation of the inhabitants. Situated on Ireland’s central plain, the county is mostly flat with a high point of 276 m (906 ft). Westmeath stretches from Lough Ree on the Shannon in the West to the shores of Lough Sheelin in the North East and southwards to Kinnegad and the Royal Canal. Its lakes are the county’s greatest asset with fishing, cruising, watersports activities and shore amenities. There is a wealth of trout and coarse angling on the Westmeath lakes, Ennell, Owel, Derravaragh, Lene, Lough Ree and the River Shannon. Lough Derravaragh is forever associated with the mythological story of the Children of Lir who are said to have spent 300 years in isolation on its waters.